I’ve said this a million times, but I’ll say it again because it’s so important… the faster you swing… the further the ball will go. For every 1mph you increase your swing speed by, you’ll gain roughly 2.2 – 2.5 yards in distance. 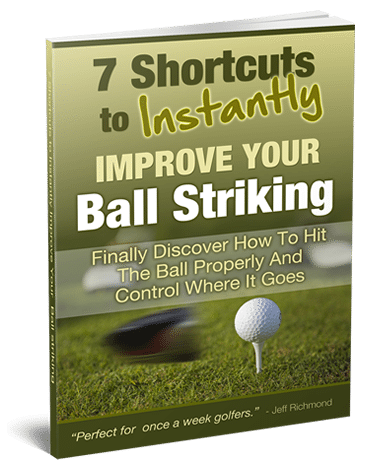 So following programs like this can help you to dramatically improve the distance you hit the ball. But, there comes a problem with increasing your swing speed. You see, when you start seeing your swing speed increasing and your ball going further and further, you’ll be tempted to train more. And more training causes a higher likelihood of injury. When you’re trying to increase your swing speed, slow and steady wins the race. I know that’s a bit of an oxymoron… but it’s the truth. You want to workout enough to stress your body to get new swing speed heights. But you don’t want to do this so much that you get injured. It’s a fine line, but you need to listen to your body. And if you feel any small niggles, don’t tough it out and work through it. Another problem I see with golfers trying to increase swing speed, is they TRY to swing fast too much. I’ve even heard of guys swinging HARD for hundreds of balls a day. When golfers do that they are training the wrong types of muscles for speed, and they’re risking getting a lot of injuries because the golf swing is one of the hardest sporting movements there is on the body. Look, when you want to do any movement in any sport quicker… you must practice quick movements to train your fast twitch muscles to fire faster. So whenever you’re training to hit the ball longer, you should do really short bursts of speed training – with lots of rest in between. Do not go to the driving range and do not buy a bucket with 100 balls to try to smack all 100 drives as fast as you can. I repeat, DO NOT do that. What you CAN do is warm-up with say 20 balls, then hit 5 balls as fast as you can with about a 1 minute rest in between shots. Then hit another 20 balls at about 80% of your normal speed. 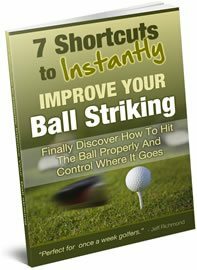 Then hit another 5 balls as fast as you can with about a 1 minute rest between shots. And repeat that routine until all the balls are gone. Now I’m not suggesting you go and do that. But what I’m saying is that you’ve got a lot more chance of increasing your swing speed long term doing something like that (without injury), instead of trying to hit 100 balls as hard as you can. But the best thing you can do, as far as increasing your swing speed is concerned, is to get a proven program which has been put together by someone like a sports scientist. And this is the program I highly recommend you use for this, because then you stand the most chance of gaining the most distance possible while staying injury free.